I've often thought that, despite the familiarity of his name, Camille Saint-Saëns is an unfairly neglected composer. Even though he wrote such famous works as The Carnival of the Animals and the Third Symphony, much of his output remains unknown to a wide audience. Luckily, the enterprising Grand Piano label started a series of recordings of his complete piano music in 2012 which I started to collect (vol. 1; vol. 2; vol. 3). I am now happy to report that the latest volume, subtitled Dances and Souvenirs has been released after a break of three years. It includes the shorter stand-alone pieces written in a dance idiom. All of these are rarely recorded so I am glad to hear someone else take them up for recording. Interestingly, the composer himself recorded several of them and these are now available on CD as well. First up is the baroque-sounding Gavotte, written in 1871 and, according to the excellent notes, originally part of the composer's first opera Le Timbre d’Argent, along with the Second Mazurka. Anyway, this is a nice little piece, not complicated but with an interesting central section with lots of suspended harmonies. Next is the first of the three Mazurkas. The first part of this has a very memorable and Polish-sounding theme whereas the middle part is more reflective and less characteristically Polish. This is a charming little miniature which deserves to be better known. The second Mazurka dates from nine years later and is a little more complex and overall more agitated in character. The articulation in the details, especially the repeated trills is excellent. The characteristic mazurka rhythm continues throughout the piece which experiences several changes of mood from sinister and mournful through to happy. The third Mazurka, the longest of the three is perhaps the most genial of these pieces. There is a cheerfulness about the whole thing which departs obviously from the Mazurka rhythm at several points. The playing here is perfectly judged. I must say that the Menuet et valse, Op.56 didn’t initially stick in the mind as one of this composer’s more memorable pieces. I was proved wrong after several listenings. There is some nice interplay between the hands in the Menuet section, around 2:00 and the pianist has plenty to do throughout. Mr Burleson is more than able to deal with the virtuosity here which occurs especially in the Valse section around 9:00 and also at the very end. As with the Mazurkas, this is a merry piece and the main theme in the Valse is one which actually does stick in the mind upon repeated listening. My first impressions were not necessarily correct. Next follow the five Valses, written at various points between 1888 and 1913. The first is the Valse Canariote which is very jolly, bouncy and fun. It’s a marvellous little piece which, as with the First Mazurka, deserves to be better known. The piece includes some ‘Spanishisms’ - for want of a better word - which are especially prevalent in the central section. These are appropriate as this was written as a sign of the composer's love of the Canary Islands. Next is the Valse mignonne which is different again as it is far lighter in character and, as it dates from later in the composer's life, the musical language has slightly changed. The ending is particularly ethereal as it evaporates up to the higher registers of the keyboard. The third of these Valses is somewhat more Nonchalante as indicated by the title. It seems to inhabit the same sort of sound-world as some of Liszt’s works from the 1860s and almost sounds like it cannot be bothered to continue. It almost grinds to a halt towards the end. However, it does continue and the overall result is very effective and rather marvellous. There are some very interesting colour effects in this piece which are worth listening out for. The penultimate piece of these five is the Valse langoureuse dating from 1903. This is played in a suitably languorous way and especially around 2:00 there is a theme which sounds like something that Liszt might have written in his old age. The overall mood here is less cheerful and bombastic than the earlier waltzes but it is still overtly sunny, especially in the coda section which also sounds very difficult indeed. It’s important to remember that Saint-Saëns was a virtuoso pianist and organist as well as an astronomer and general polymath. The last Valse is the Valse Gaie written when the composer was almost eighty and the mood belies that fact. Again, there are more Lisztian echoes here especially in the first minute or so. This piece is brilliantly executed with its strange distorted rhythms and off-beats. The middle section around 3:00 is lovely and nostalgic. Overall, this is certainly another joyful little essay, extremely well played throughout. The last three pieces on the disc are a collection of Souvenirs based on Saint-Saëns various travels. Une nuit à Lisbonne is full of Iberian melancholy and is a piano transcription of a piece written for orchestra which was first performed in Lisbon and dedicated to King Don Luiz. It has a whiff of nostalgia about it which is very atmospheric. The piece is generally peaceful, a fact explained by the subtitle of Barcarolle. Souvenir d’Italie starts very strangely with an impressionistic insistent bass-line which dissolves into a small cadenza-like section before the piece starts properly with an episode sounding like a gondola song. Despite some very virtuosic sections the overall mood is one of calm and yearning at the same time, especially around 2:00. In contrast, there is a cheerful section (4:30) which is rousing and memorable. Things quieten down again after this and the yearning Italianate gondola song returns. This is followed by a recapitulation of the impressionistic introduction before the piece ends with a suitably quiet conclusion. Lastly comes the Souvenir d’Ismailia which sends us off to Egypt which Saint-Saëns visited frequently. The mood is similar to the Africa Fantasy - dating from a few years earlier - with alternating use of nationalistic sounding themes from the area. The bouncy theme (3:00) is a real 'ear-worm' and sounds almost Baroque but with a twist of Egyptian dance-music. The coda involves a lot of jovial leaping about. Marvellous stuff. Overall, this is a superb disc played by a very talented pianist who is more than able to cope with the Saint-Saëns' myriad technical details and colours. 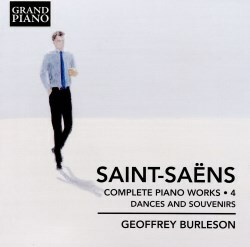 It will also, I hope, bring Saint-Saëns’ piano music to the wider audience it deserves. I will certainly play this CD frequently. The cover-notes by the pianist himself are very interesting and detailed. They contain many facts which are pertinent to the music. The recorded sound is excellent and I very much look forward to volumes 5 and 6.